Fish right here on Arrowhead Lake, or choose from hundreds of lakes nearby. We have ample boat docking spaces and a fully screened fish cleaning house for your day's catch. 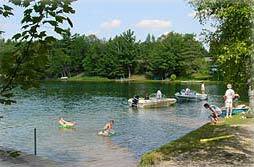 We have an excellent sand bottom swimming area, gently sloped for all types of swimmers.